CYBER MONDAY! LAST CHANCE TO SAVE! CYBER MONDAY! THIS IS IT! THE FINAL LAP! LAST CHANCE TO SAVE! It’s Cyber Monday. You’ve survived the holiday. Time to relax? Not a chance! 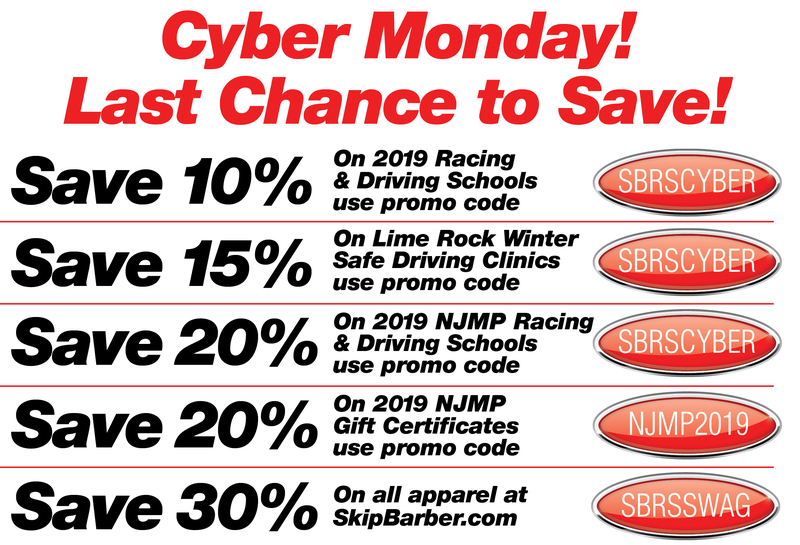 Today’s the last day to grab up to a 20% discount on Skip Barber Racing Schools and Gift Certificates for 2019. Accelerate to the phone 866-932-1949 or to our website www.skipbarber.com and don’t let this incredible deal pass you by. Pick your favorite track – Sebring International Raceway, Road Atlanta, Lime Rock Park, WeatherTech Raceway Laguna Seca, New Jersey Motorsports Park and coming in spring, Gateway Motorsports Park in St. Louis. Pick your school — Teen Safety and Survival, One Day Driving, One Day Racing, Three Day Racing or Two Day Advanced Racing. Check the schedule, then check out the discounts. But, do it today! Time is running out faster than a three car finish on the final lap!